ATSIP travelled the furthest South West it has been in its history for the 27th Annual Conference at University of Plymouth this year. 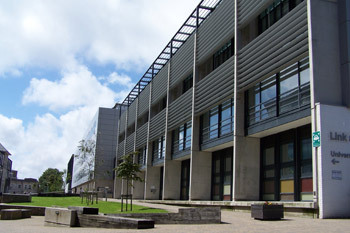 The accommodation was suitably positioned a few streets away from the main campus building and was nicely arranged with en-suite and kitchen facilities. 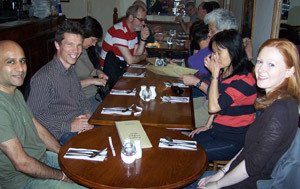 Wednesday (4th) the reception in the Psychology Department was well managed by Lynne James and her other colleagues. 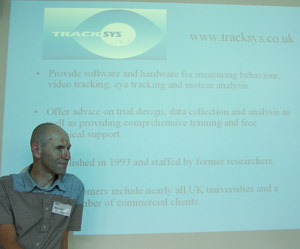 The programme with a demonstration from Dr Richard Lilley from Tracksys of the latest Eye Tracking Software and its use in experimental and research situations, including licensing arrangements. We were encouraged to try out the gear which members copiously did. Eye trackers are increasingly being used and improved software makes the product an attractive proposition. The latest generation of screen-based eye trackers are designed to work with laptops, tablets and monitors, whether you are looking at images, PDFs, text, webpages, videos or games. 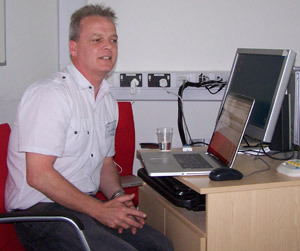 Richard showed how they can be integrated into larger projects with other data; such as behaviour, EEG and other physiological measurements. The evening meal was at the Pasta and Pizza Bar in the town centre which necessitated a walk through the shopping and wide avenues of Plymouth and glimpsing a passing look at an Andy Murray match in progress! (He won that one). After the meals members deliberated in searching out the different cultural aspects of Plymouth, including the Barbican and Hoe and a host of friendly pubs. Thursday (5th) was a full day and after an introduction from the Chair (Patrick – Trinity College Dublin) we had a short talk from the Associate Head of the School of Psychology Professor Jon May who eulogised on the support of the dedicated technical support staff/team. We thereafter had a tour of the department and noted the design of open space for students to work on the main corridors and the layout of experimental labs and research areas. This was followed by "A little known fact. . . students hate statistics! How we can recover the initiative, and teach better" by Peter Beaman from Loughborough University. Peter summarised his own history/experience of being an end user and also a provider of the `dark arts' of variance etc. Innovation and creative ideas are proposed (Flexible lab space, Interactive Turning Point, Pacing and using different learning styles of teaching i.e. Buddying up) - plus on line surveys carried out with students during the last two years. The results were discussed in terms of providing a better road map for learning and understanding both the negative and positive experiences of SPSS/Stats in class/lab environment. 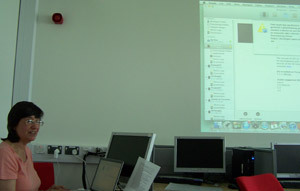 Next up was Gary Freegard from Swansea University talking about Micro-controllers and Psychology. He showed us examples of a project to improve the simplicity/speed of the design and building of electronic based testing equipment by the use of micro-controllers. This has involved investigating the multiple types of micro-controllers and their associated programming packages. This has enabled Gary's department to update their Jensen pads, develop an independent event logger, investigate the use of accelerometer/gyros for alternative human computer interactions, and develop a USB ratings system. He has also produced a response pad that has significant benefits over other commercially available response pads. 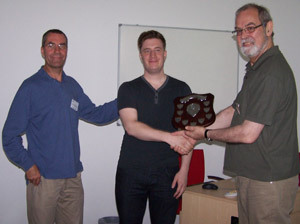 Peter Beaman from Loughborough University. 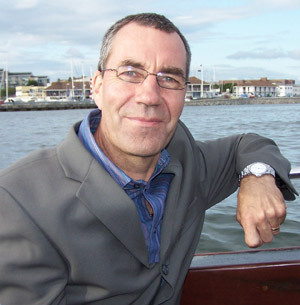 Colin Burke from University College Dublin. After a tasty and well provided lunch we continued the programme with Demo: Qualtrics Web-Based Surveys by Colin Burke from University College Dublin. Qualtrics is a web-based research surveying software, which is very useful with psychological research, as it enables users without coding knowledge to develop, publish, and collect responses to surveys. 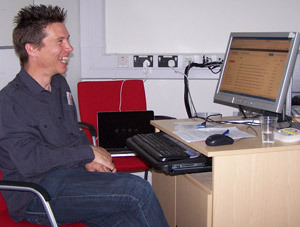 It offers many advanced, but user-friendly features such as, easy survey design with question libraries, point-and-click editing, automatic choices and question randomisation. Qualtrics contains a comprehensive list of question types including text entry, matrix, multiple choice, group & rank, drill down, rank order, heat map etc. Other features include collaboration, polls and reporting. Data collected can be analysed online or downloaded to CSV or directly in SPSS. 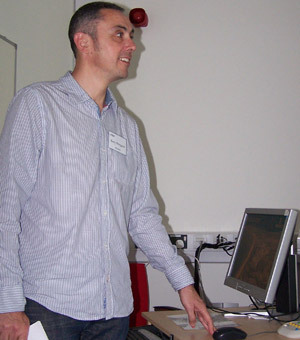 This was followed by Wakefield Carter from Oxford Brookes University who amended his original talk on Matlab (due to unforeseen technical reasons!) to show us the simplicity of Google Docs and the way on line surveys (Forms) could be constructed in a short time frame. The usefulness of Google Docs Form was demonstrated with an array of sample questions, open, closed or even grid format. Sections can be created and page breaks if the questionnaire is long. When you've completed your form/survey, you can send it to respondents via email or by sharing the form/survey on Google+. Comparing with Survey-Monkey Google Form is free and you can create as many form/surveys as you like and has scale and grid features which make it great for student projects/practicals. Next theme was A Simple iPad Questionnaire Using XCode4 by Lynne James of Plymouth University who showed us that technology has gone mobile! It also seems that "data gathering" has also now going mobile! Through the use of iPods and iPads the change is happening rapidly. Lynne went through the creation of an app that consists of a questionnaire that is currently in use as an initial data gathering exercise for one of their PhD students. Lynne demonstrated some of the coding and talked about the problems encountered, especially the long list of hoops you have to jump through to be able to deploy to a device! 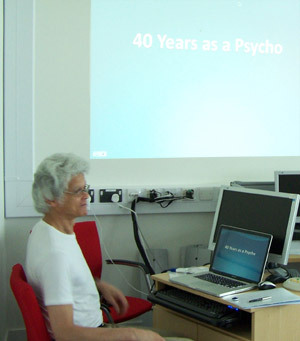 After the coffee break we had a historical walk through being a psychology technician for 40 years at the University of Hertfordshire by Noel Lawler. The main change has been the science and technology plus the size of University institutions and departments (when courses had 24 student intake in the early 70's). Noel talked about the specialisation of knowledge one started with and what was gained through all the changes from Polytechnic to University status and the technological developments! When Noel arrived, the basic workshop was not there and some of the equipment was mechanical-engineering kit. He was then told practicals started in a few weeks - you have to adapt. The technology gradually changed with mainframe computers, mini-computers, microcomputers and again with the internet. I think we know the rest but the change from being 'kit makers' to 'kit users' and programmers has been massive. I think a lot of people resonate with those thoughts and it gives us all much to think about. Next was the AGM and the election/selection of ATSIP officers, the accounts were distributed and agreed on and a general discussion took place about next year's conference. 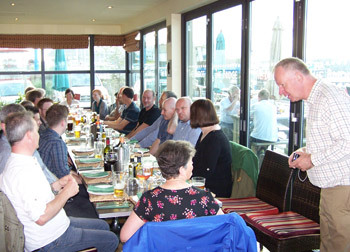 The evening conference meal was at The Bridge Restaurant at Mount Batten which involved a nice stroll through the old harbour and onto a water taxi which must have been a first for many members. 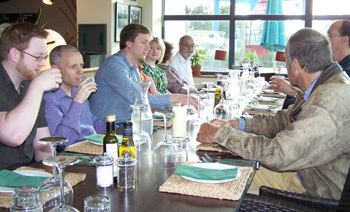 The meal was absolutely delicious and we had the HEA Psychology Discipline Lead Dr Julie Hulme at the table. After the meal it was a steady walk back to catch the last water taxi of the night or it would have been a challenging swim!!! Julie's talk was interesting and rewarding as it showed that technical staff in psychology department and elsewhere are highly valued and have many skills that academics need for teaching support, running practicals, training students in research skills and labs, projects providing multimedia support for teaching and giving time to students when no one else is around. Julie also outlined the amount of resources and funding that ATSIP members could tap into which is very encouraging as this is one area that we really should be looking at. 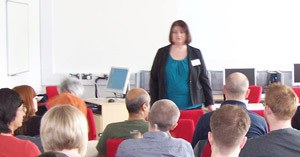 Julie re-emphasised that psychology and demonstrator roles are pivotal to the success of psychology depts. The new steering group aimed at "Working with AHPD/BPS to identify key features of technical role" is hopefully going to achieve a better recognition of us. 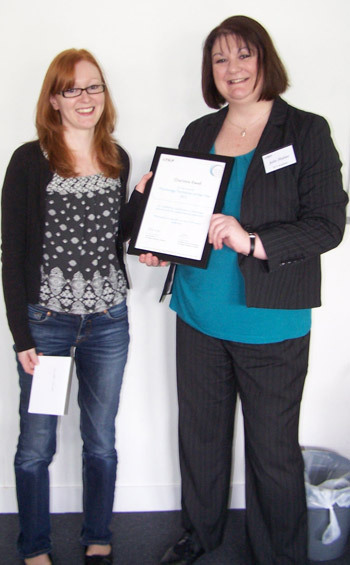 Julie ended by making the HEA/ATSIP award to the technician/demonstrator of the year which was jointly won by Charlotte Elwell York St Johns University and Laura Shurlock-Evans University of Worcester who both had exemplary accolades by members of staff/students and worthy winners. 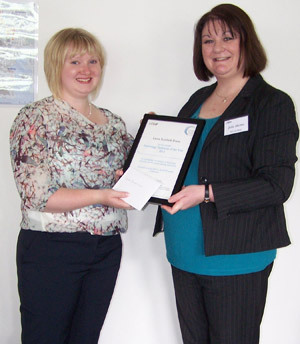 Friday (6th) was a talk by Dr Julie Hulme HEA: on Supporting Psychology Education and the award of the HEA Psychology Technician of the Year. Download pdf - HEA funding opportunities – one click away! Following that, Jamie Goodliffe from The University of Winchester gave an impressive demo of OpenSesame, which is a freely available open source experiment builder for the social sciences that has been under continual development for the past few years. OpenSesame seems to offer many features not seen in other software packages such as built-in audio generation, custom plugin support and the ability to execute Python scripts. 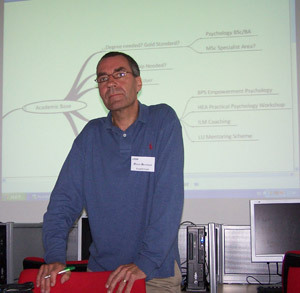 After an overview of the projects' scope, the software was demonstrated and its merits were considered in relation to existing experimental design software. I think Jamie proved it was both simple, intuitive and has graphically ticks all the rights boxes. Finally after coffee the Keith Nicholson Award was made to Jamie Goodliffe for his well turned out demo of OpenSesame which was voted best presentation at Conference. Peter Beaman the President then started a debate about the nature of changes that are occurring in HEIs with respect to larger Departments (into Schools) and centralisation of Technical Staff from their Psychology base. This is already underway and without really considering the consequences. The BPS and AHPD are now also concerned due to changes in technology and new social networked ready students that perhaps infer that technicians are really just IT or generic support staff. The membership showed their concern with many stories of what was happening on their home front and what we can do to challenge it. It was decided to look at the Role Profile being requested by BPS/AHPD for accredited Psychology courses in the future and through an online survey to target members for responses to their job title/duties and attitudes towards work and CPD etc.